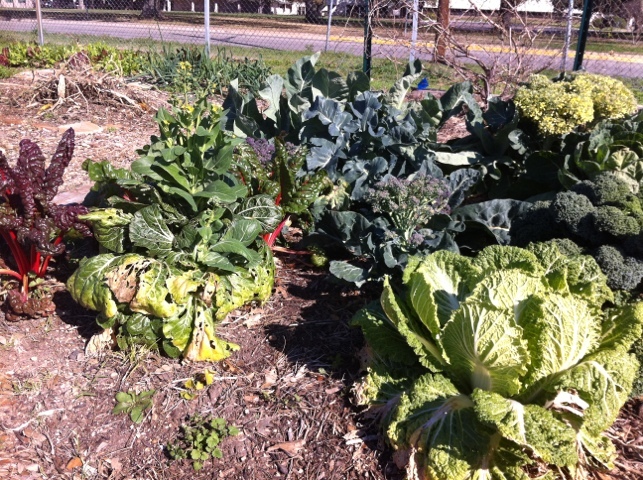 I stopped by Sunshine Community Garden because I was in the neighborhood Sunday morning and I passed an amazing section of land with an abundance of produce growing on it. I just had to see what the lovely vegetation was. 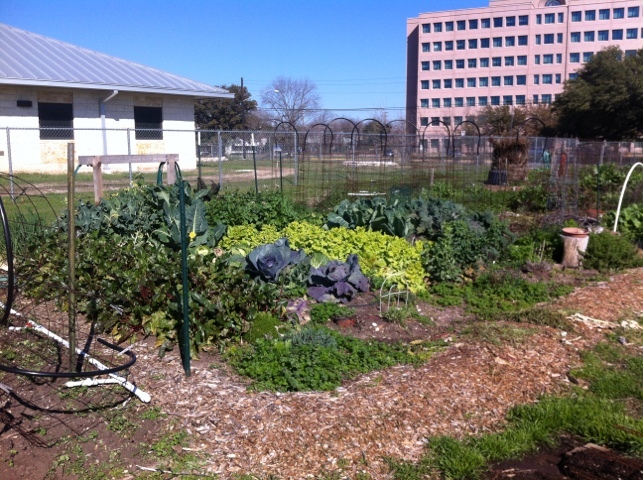 A community garden is a plot of land where anyone can have their own patch of land – typically for a small fee ($90 per year at this garden for a 20′ x 20′ plot) to cover the costs of administering the operation. Sunshine also requires members to do a nominal amount of community service at the garden and at the School for the Blind, I’m told. 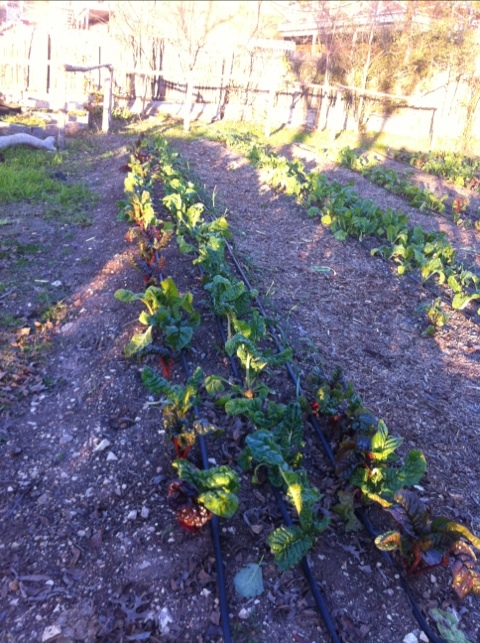 The garden administration provides basics such as watering sources (spigot and hose) and oversight of the entire plot. Individual “renters” are responsible for tending their subdivisions. 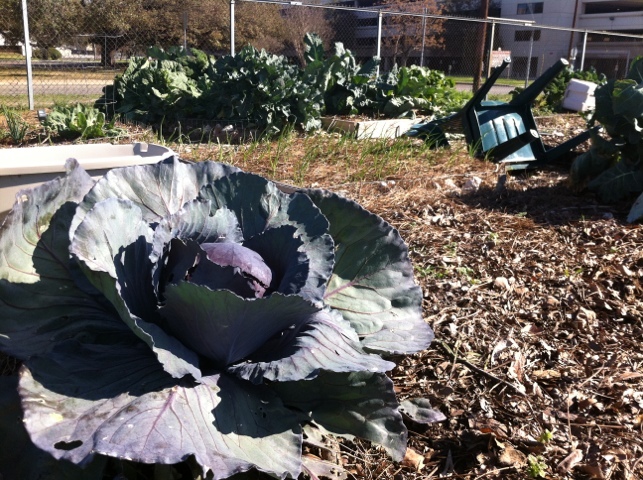 You can grow an enormous amount of food on a 20′ x 20′ plot of land. I asked a gardener what she does with all of the food and she said that she gives it away. She said one man has three plots – 1,200 square feet of land! He could start his own farmer’s market. Hmmm… I smell a business opportunity! I am seriously thinking about getting a half plot to learn more about growing. At the very least it would be a learning experience. 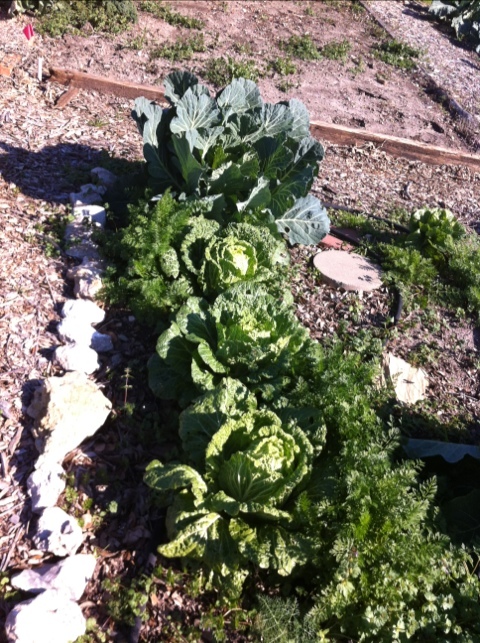 Below: Some type of cabbage looking very green and delicious. 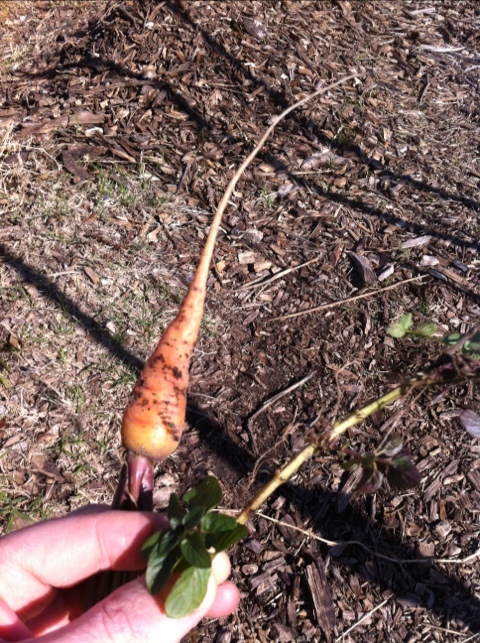 Below: A kind gardener pulled up a young carrot for me to try right out of her garden. It was delicious, albeit on the small side. The other plan there is a piece of a chocolate mint plant. The universe gave me a lesson the other day, with a little help from me. My morning began earlier than I had wanted – my future was on my mind and I was losing sleep. The topics: money, pride, and my new career path. Do I have what it takes? What if I look stupid? What if I fail? Is this career change a colossal waste of resources? Soon, the cat was crying – impossible to sleep through – and I was forced to get up and start my day when I really wanted to stay in bed and brood. But, I needed to catch the bus. It would be more accurate to say that I had decided to catch the bus. I think the stress of driving has been getting me down. The bus is so calming and I can read and relax. I was looking forward to a leisurely ride to work. After eating and dressing, I realized I had very little chance to be on time for the bus. I hurried out the door and knew that if I merely walked to the bus stop, about 400 meters away and hidden around a street corner, I would likely watch it pass by. Should I run? What if I look stupid? What if, after running, I’m still late for the bus? What if, in my haste, I forget something, unable to drive home to get it? I gripped my grocery bag of things and began to run. There I was, jacket flapping, unkempt hair bouncing, arms swinging. Pride discarded, I had a goal and there was one way to achieve it – 100% commitment. A leisurely, half-hearted trot was not adequate. And taking time to assess the situation was not an option. So, I ran. 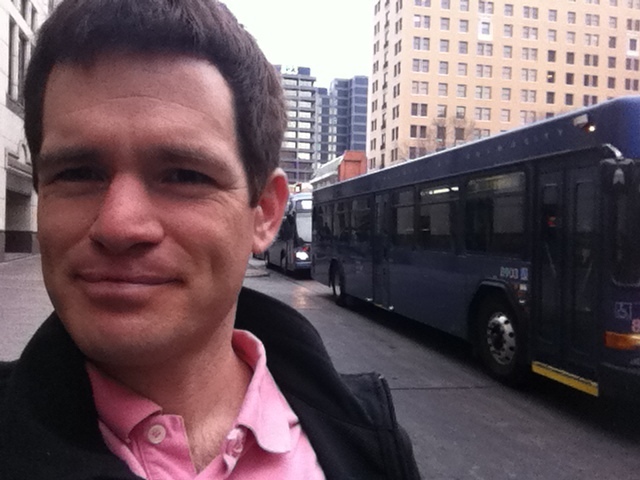 When I felt the power of casting aside doubt and resistance to achieve the humble goal of taking the bus, I ran with even more resolve. When I got to the corner, I saw the bus approaching, yet I still had 50 meters to run. Everyone on the bus would watch me striding to make it, and it wasn’t clear the driver would decide to stop or not. I’ve seen buses pass people by when they were not yet at the bus stop. If I were late, my failure would be seen by a bus load of riders. Below: A photo I snapped of someone’s garage while running in central Austin. I pressed on at a full run, bus only meters behind me, until I arrived at the stop. I felt the eyes of the bus’ passengers on me as I ran. As I approached the bus stop, I could hear the engine slowing. I looked up and the saw the driver acknowledge my effort. I had made it. This small event on an ordinary day had immediate meaning for me. Despite how small and insignificant my decision seemed, I had learned quite a bit. Decide – Make a decision to pursue your goal. Go 100% – Your goal deserves your full effort. Put your full self and mind into the goal. Your resolve will harden your desire to achieve. Act now – Hesitating for even a moment can mean a missed opportunity. Once you identify your goal, don’t cheat yourself by waiting. Don’t let up – Distractions will come up. Your mind will raise thoughts of resistance. The universe will deliver challenges to slow you down. Relenting will only be a cause for later regret. Pride is irrelevant – If you fear failure, if you fear looking stupid, you are merely being tricked into giving up your goal. Acting out of fear is the quickest way to defeat. Your goal is far too important to give up because of erroneous fears or the perceptions of others. You deserve better. What is your “bus”? What goal are you waiting to pursue? 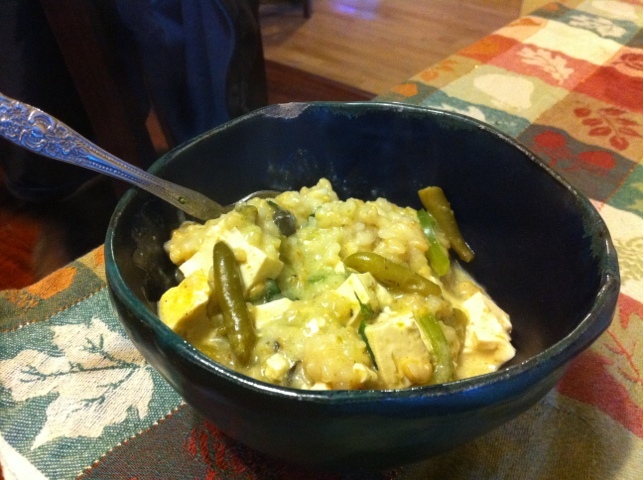 Thai curry! Oh, how I love thee. Spicy, herby, salty with a hint of sweet. And then flavors I can’t even recognize. I decided to make a curry from scratch and learn more about this most aromatic and delicious of South Asian meals. It started with two amazing flavors: ginger and lemongrass. It was my first time working with lemongrass. It has a gentle lemon aroma. 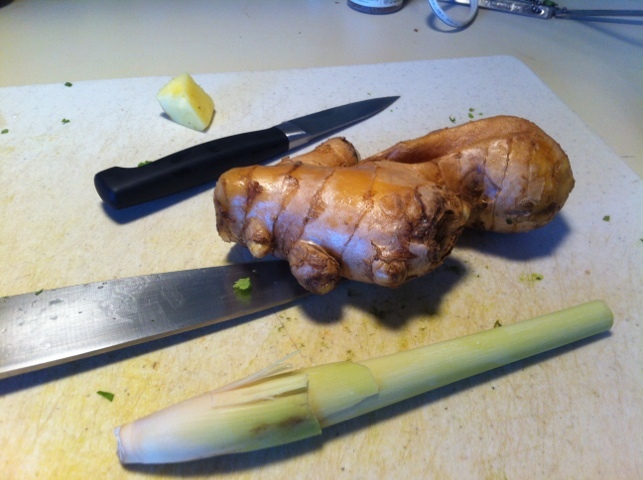 I peeled back the leaves of the lemongrass to get to the solid light yellow bulb. The main ingredient in the curry paste is the chile peppers, in this case jalapenos. 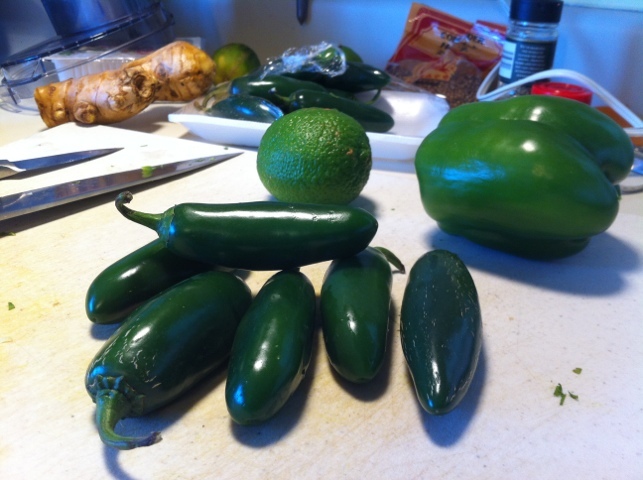 I thought six jalapenos sounded like too many, but I guess removing the seeds helped, because I found it to be quite mild. 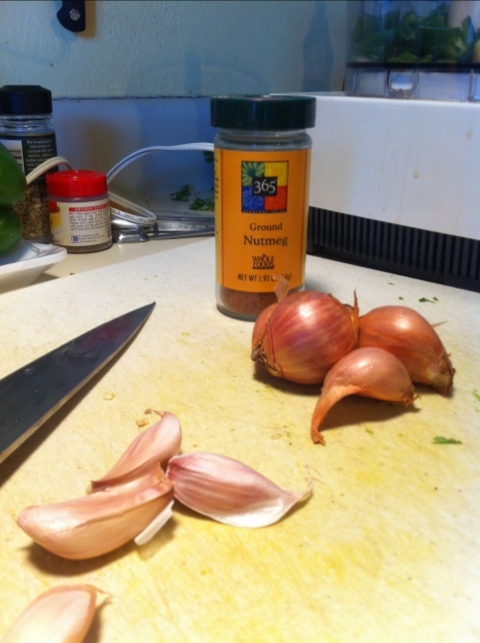 I was a bit surprised to see that most recipes on the internet that I looked at called for both nutmeg and shallots (not necessarily together). Shalloty-oniony flavors aren’t really prominent to me, and nutmeg certainly hasn’t stood out for me in green curries. In they went, anyway. See below. 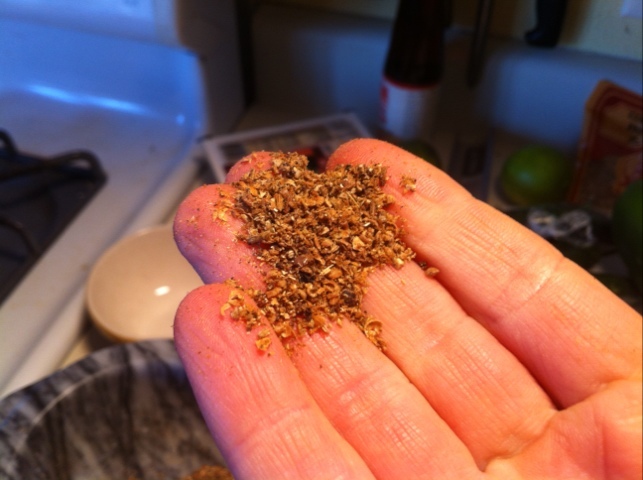 The recipe also called for toasting coriander, fennel, cumin, and black peppercorn seeds, then grinding them. 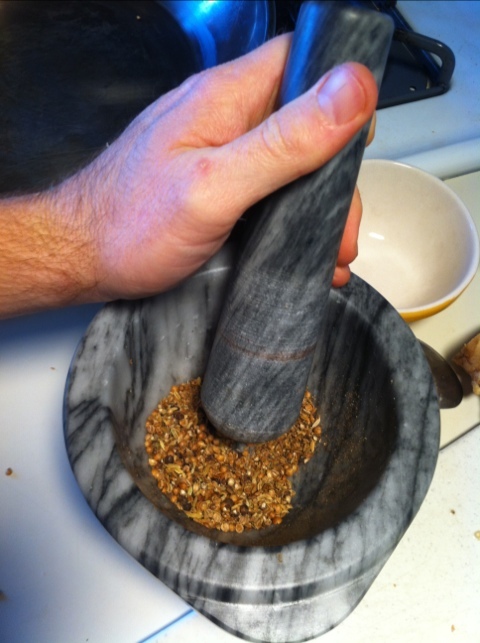 I don’t have a spice grinder or coffee grinder, so I went old-school with a mortar and pestle. I love the physicality of using this age-old tool. 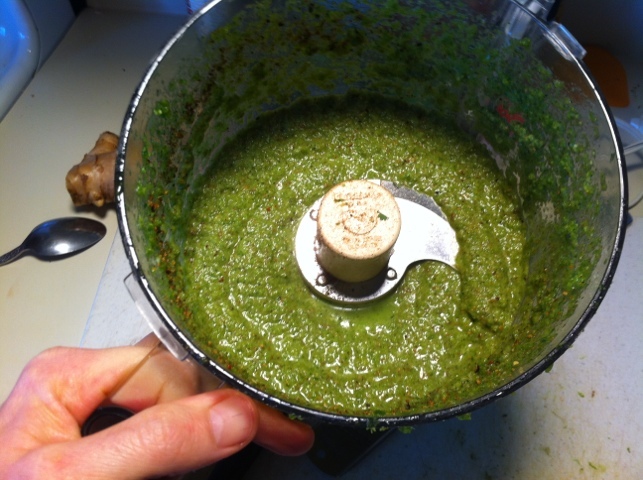 Below: All of the paste ingredients go into the processor until they are nice and smooth. 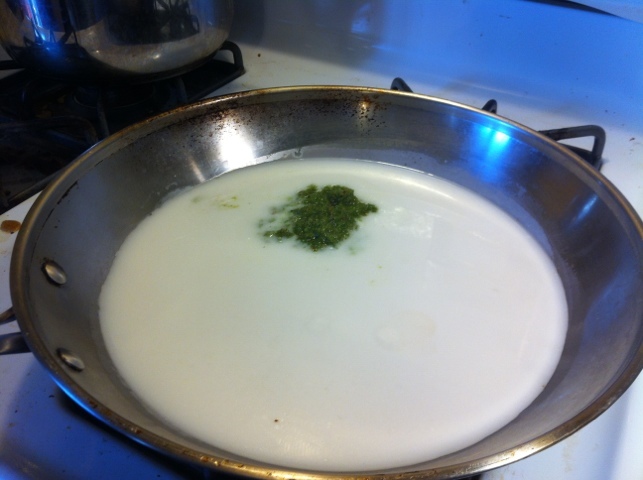 Once your paste is complete, it’s time to create the curry dish, which involves cooking the paste, heating the coconut milk, and cooking the vegetables/meat in the hot milk. 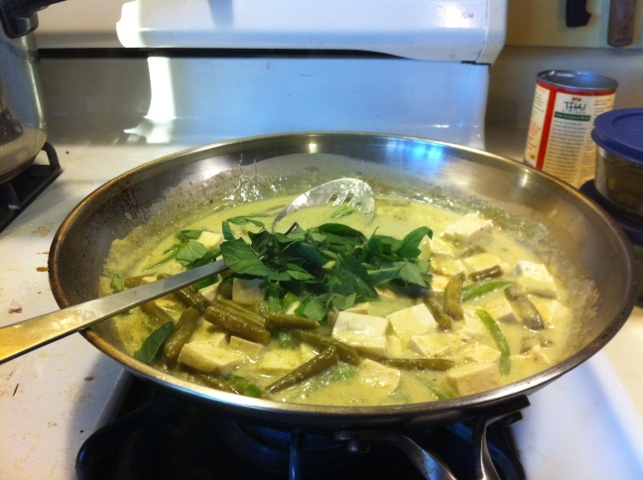 Below: All of the Thai curry recipes I’ve ever seen involve sauteeing the curry paste for a minute in either oil or the coconut milk. 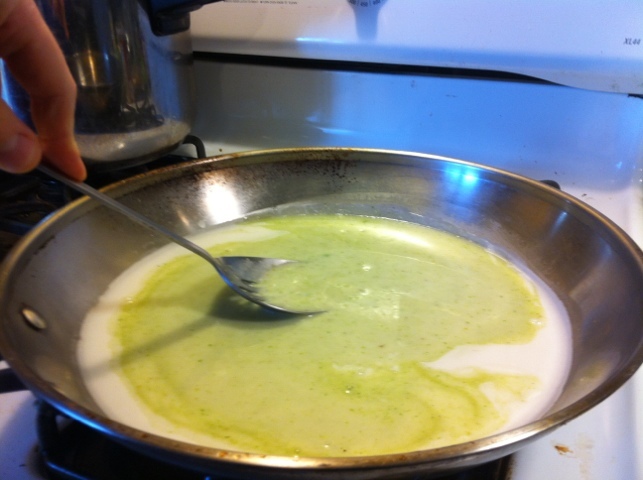 In this case, the recipe called to cook a couple tablespoons of paste in 1.5 cups of coconut milk. Below: What a lovely image! The thick curry paste blending into the thick coconut milk. The beauty of nature and food continuously inspires me. Below: Thai basil leaves add a wonderful dimension to the dish, which already has so many flavors. I had a little leftover napa cabbage, so I decided to make a stir fry. 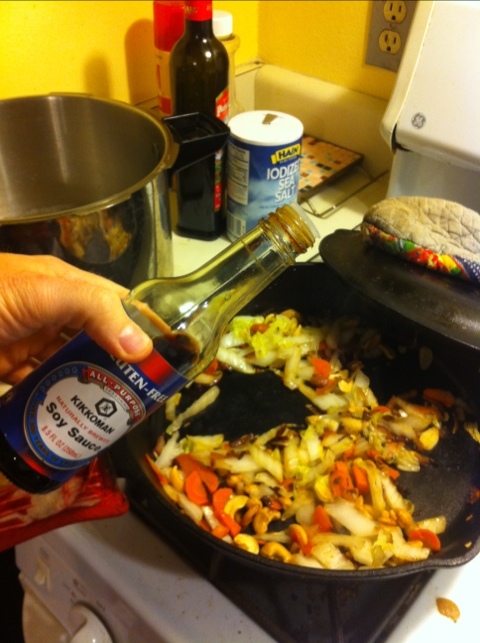 Cabbage is terrific for stir fry – it softens up a bit, but retains some crispness if you time it right. 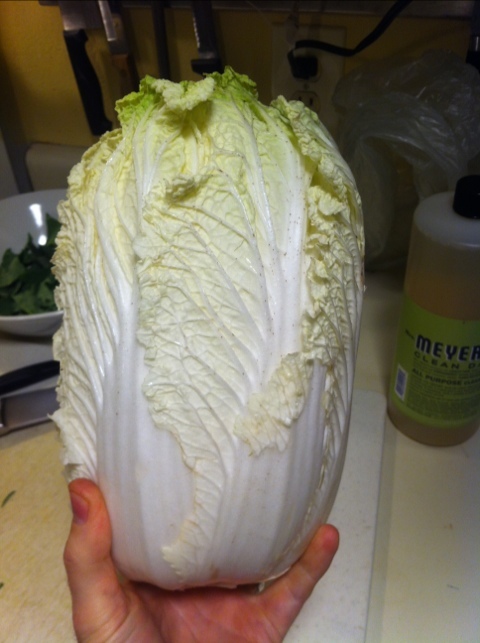 Napa cabbage is a beautiful plant; it has pale green and ridged leaves, broad white parts which provide crispness, and a cool clean flavor. I love to smell cabbage – it has the sulphur aroma associated with many of the other brassica genus plants (broccoli, Brussel sprouts).It is the sulforaphane (which contains sulphur) that is one of the sources of possible anti-cancer benefits of cruciferous vegetables. 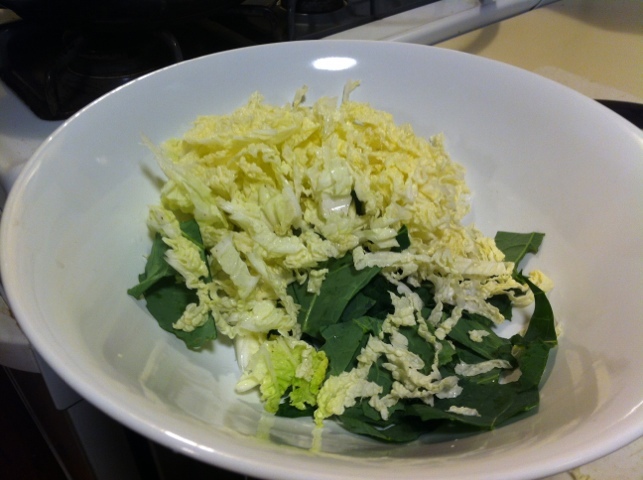 I used Napa cabbage, and wrote bit more about it, in a recent post about a delicious Asian Napa cabbage salad. 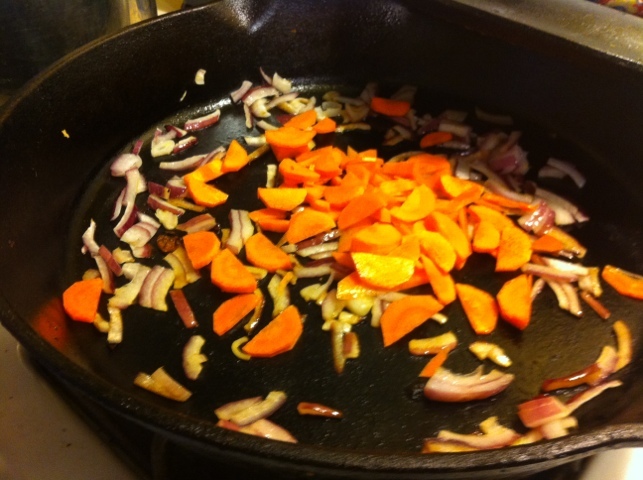 Below: I started with onion and carrot to get a head start on softening them up and bringing out their natural sugars. Below: After the cabbage cooked down a little bit and softened up with the pan cover on, I added a couple of ounces of soy sauce, then let the flavor concentrate over medium heat. 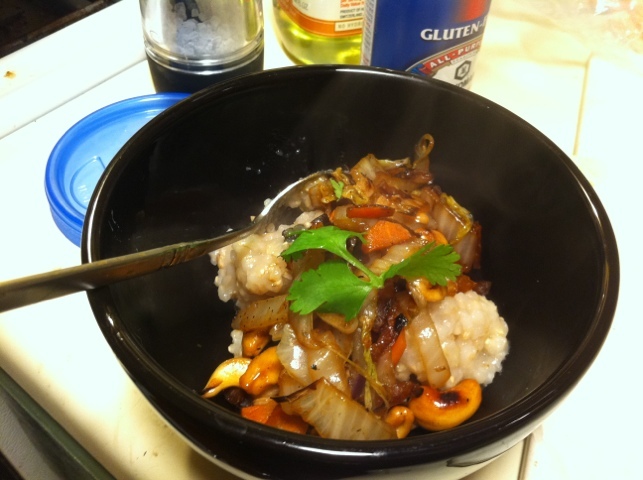 The final product was delicious: a creamy short-grain rice, tender-crisp vegetables, crunchy-smooth cashews, and the umami satisfaction of soy. A sprig of cilantro for a bit of color, tops it off. I chose a lovely black bowl to contrast the meal. I find that when I think about presentation in my home cooking, it helps center me and connect me more spiritually with the meal and receive it in a tranquil state of mind. Below: Oh yeah, I put some cashews in there, too, for texture and their wonderful buttery flavor. 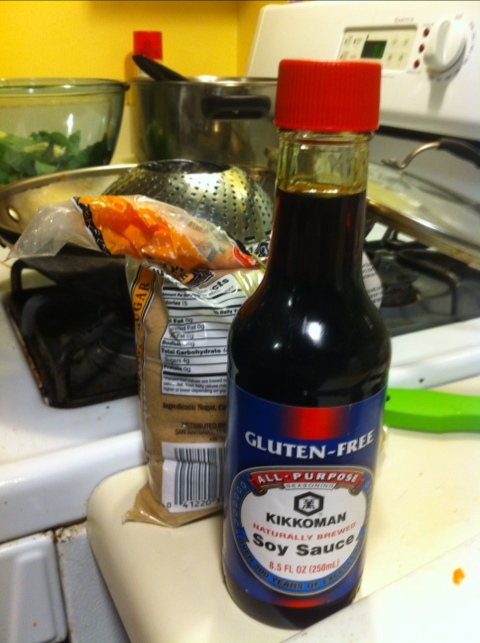 I recently rediscovered them and plan to keep them well involved in my food rotation. 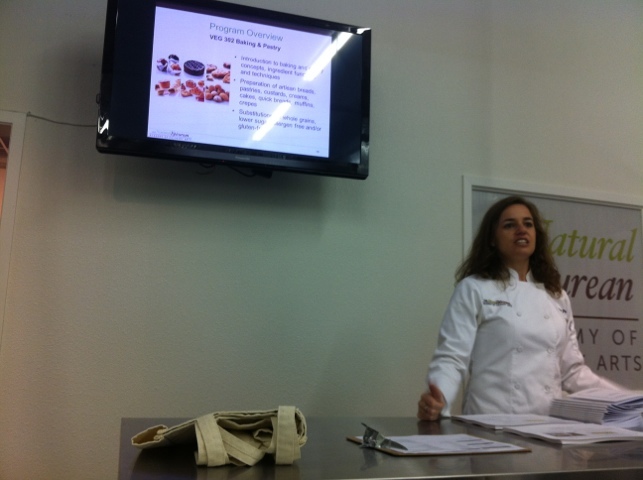 Cashews are rich in iron and protein, but they are very calorie dense, so don’t go overboard. 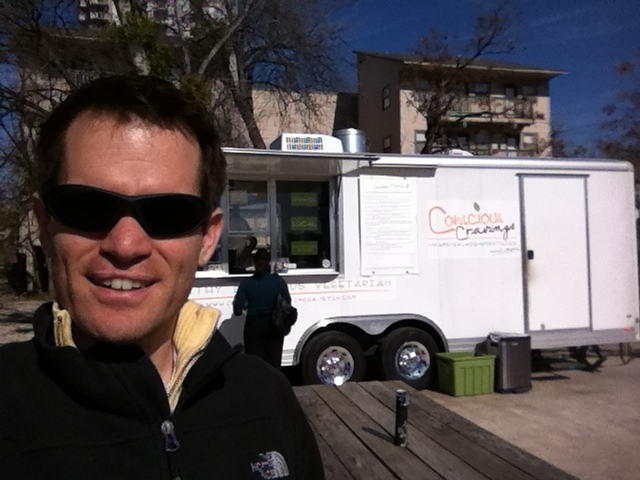 I’ve been trying to check out vegetarian restaurants and food trucks in Austin and Conscious Cravings had great reviews on Yelp, so I decided to stop by a couple of times to give them a try. They have a very nice, clean trailer parked on MLK near Guadalupe. Clearly, a clean trailer is helpful for any food vendor, but when your image is of health and you align your mission with ethical eating, an uber-slick exterior is very consistent. 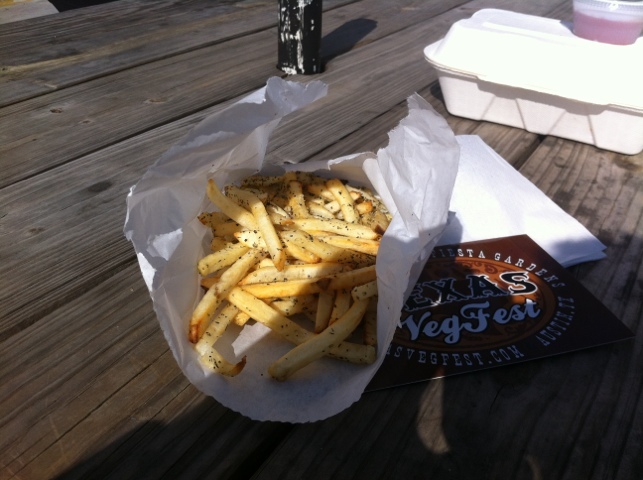 Below: Rosemary French fries. A workday indulgence. I tried a couple of dishes. One was a tofu dish with chimichurri sauce and what I believe was sriracha. I especially love their basmati-quinoa blend, which they serve as a base for the gluten free customers (normally, dishes are served as a wrap). There was also a layer of lettuce, and a few slices of tomato, as well. Overall, it was like a healthy, balanced salad with vegetables, grains, and protein. Plus terrific flavor. Note – I don’t think this is actually on the menu. I think I miscommunicated with the cook and ended up with a hybrid of two menu items. Still, it was very good! 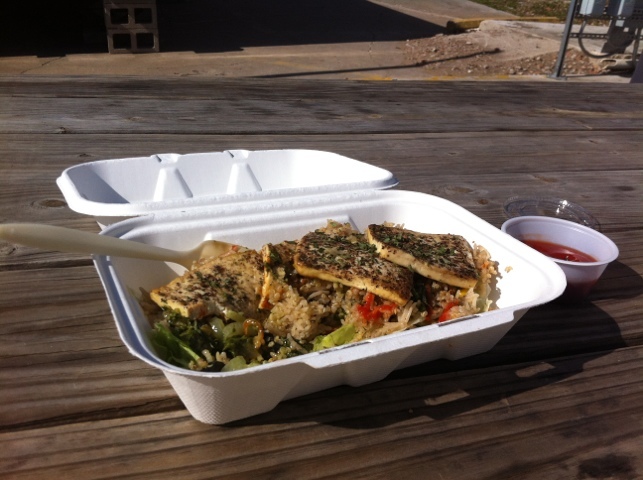 Below: Three thin slices of tofu with chimichurri sauce, grains, and lettuce. 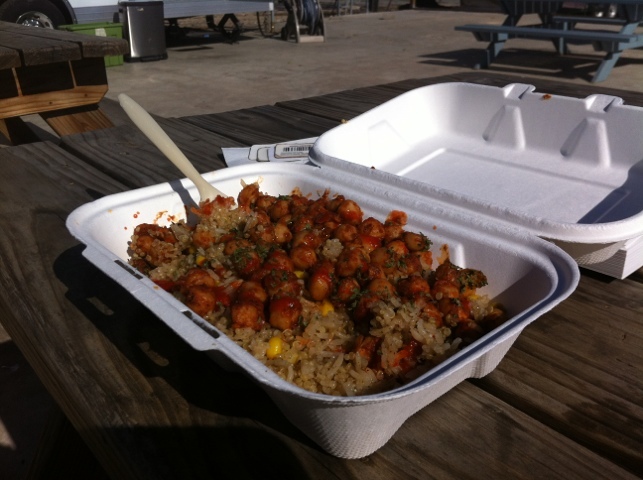 I also tried the spicy chickpeas and loved them! 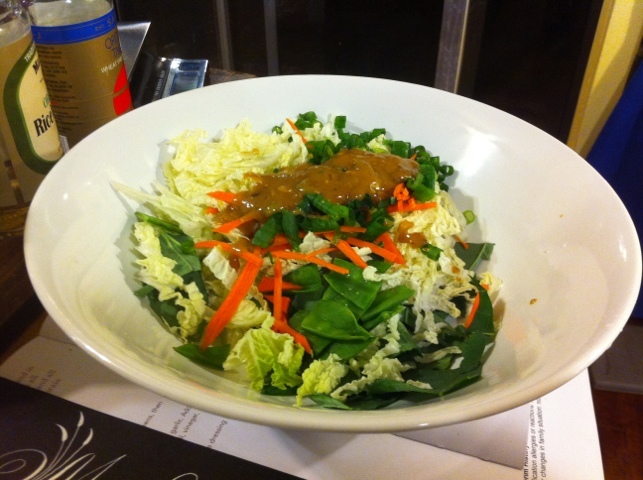 Also served on the lettuce-quinoa-basmati base layer, they are spicy and nutritious. 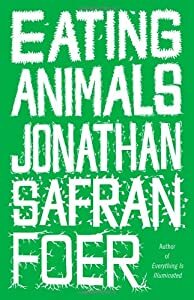 Eating Animals, by Jonathan Safran Foer, has been on my to-read list for quite some time now. I’ve been a reluctant, uncertain, and on some occasions enthusiatic, meat eater at varying points in my life, and any thing or anyone who takes the time to stimulate my thoughts on the topic is nearly always worth my time. My mixed feelings about meat probably started when I was a child. My most salient memories of meat were of choking on huge, tough mouthfuls of steak and being saved from death by my parents. A wad of meat lodged in one’s windpipe creates a lasting memory, to be sure. Not exactly a promising beginning for a carnivore in training. The lesson? Meat is tough, dry and it will kill the eater if he or she is not careful. After reading Eating Animals, the idea of meat has me feeling no safer, but for different reasons. Vegetarians are often accused of being to sentimental about animals. But who is more of an irrational sentimentalist: The person who doesn’t eat meat due to concern over the treatment of animals and the effect of raising animals on the environment, or the person who eats factory-farmed, unhealthy, arguably inhumane, and polluting animal flesh simply because “it tastes good” (i.e., “it makes me feel good”)? The frequent use of antibiotics in the raising of animals has had a documented effect on weakened efficacy of antibiotics in humans. Factory farming, with its high density of animals in one location, increases the risk of the development of superbugs that can create global pandemic. Selective breeding of animals to increase their growth rate can also erode their natural abilities to withstand normal environmental conditions, requiring additional resources to support their survival. An example would be chickens with an over-large breast due to selective breeding whose legs cannot support the weight of their more profitable bodies. The biggest ethical concern is not the mass killing of animals, which most people focus on, but the systemic mistreatment they suffer in their raising. Why are we okay with mistreating animals to satisfy our taste buds* but not okay with mistreating animals for the sake of art, for example? Would creating conditions likely to result in animal pain for the sake of a museum display be acceptable? A handful of reasons to not eat animals are offered: (1) better health (2) ethics of animal treatment (3) environmental impact of animal farming (4) increased risk of pandemic due to bird or swine influenza caused by factory farming. Pig farms directly pollute the environment due to the prodigious amounts of feces produced by swine. 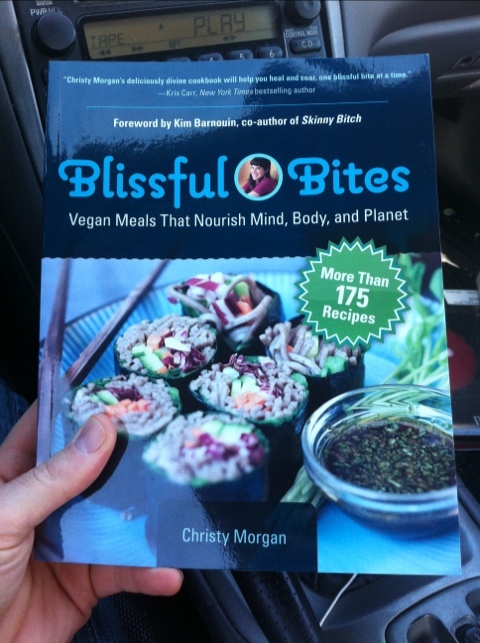 For me, the ideas in this book are not about passing judgment against meat eaters. We have to approach each other with understanding and empathy. I am an anxious part-time carnivore myself. It is about being conscious of how meat comes to your table, who brought it there, and what it does to the planet and your body. * It appears to be sound science that humans in general can do quite well without animal foods by eating with a minimum level of conscientiousness, so I conclude that the only reason for eating animals is for whatever pleasurable experience that may bring. Some supplementation may be required. While strolling along North Loop Rd. near Burnet Rd., I happened upon this sign. I like farms, so I checked it out. 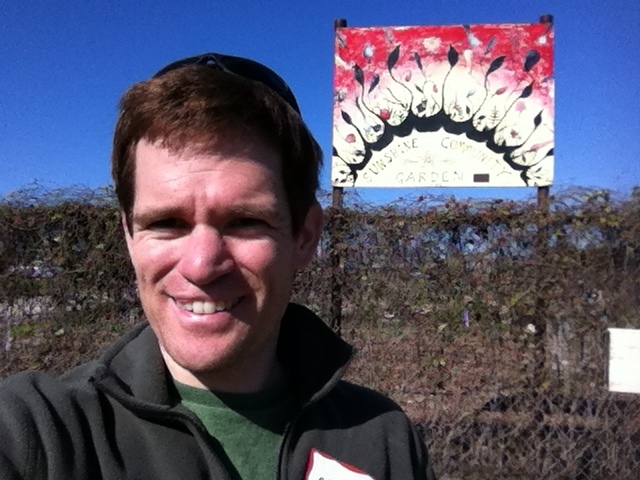 The sign belongs to 5-Mile Farms, which is a project of Resolution Gardens, an Austin-based project to localize our food supply. 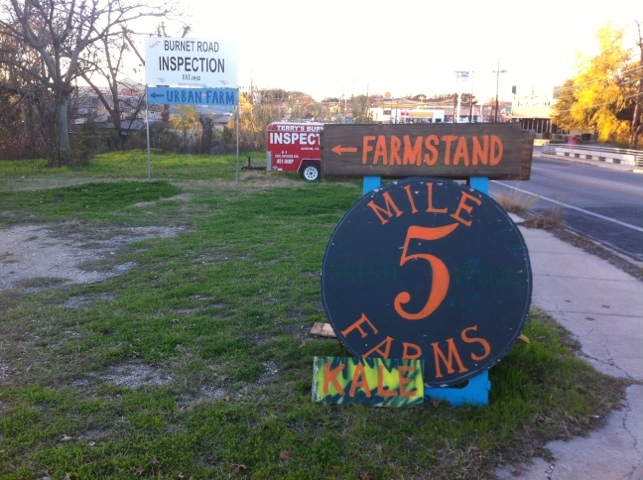 5-Mile Farms keeps retail hours during the week (see their website) and also sells at the HOPE farmer’s market (Sundays in East Austin). 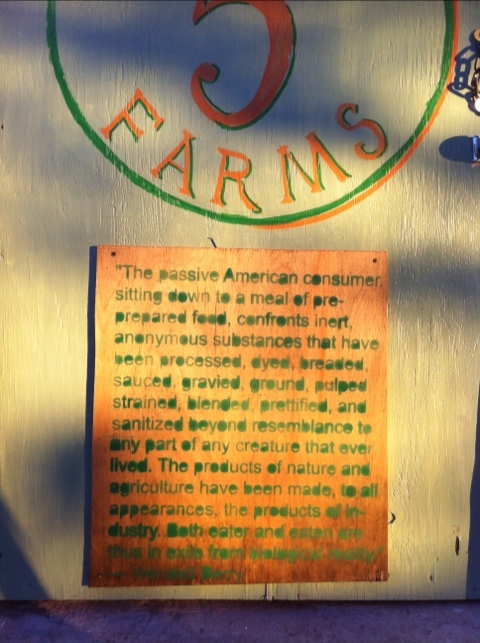 What’s cool about 5-Mile Farms? 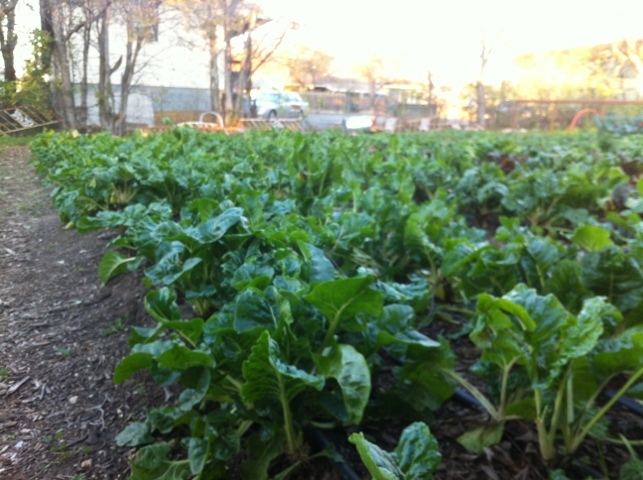 It’s a farm right in the city! Yes, there’s Boggy Creek Farms and Springdale Farm, but this one is right in prime real estate near Burnet Road. Very cool. Below: I love this quote. 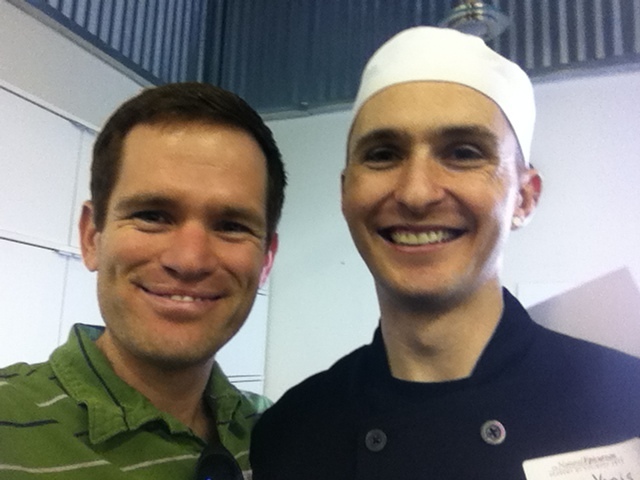 It’s pretty well sums up why I chose to attend The Natural Epicurean culinary school. 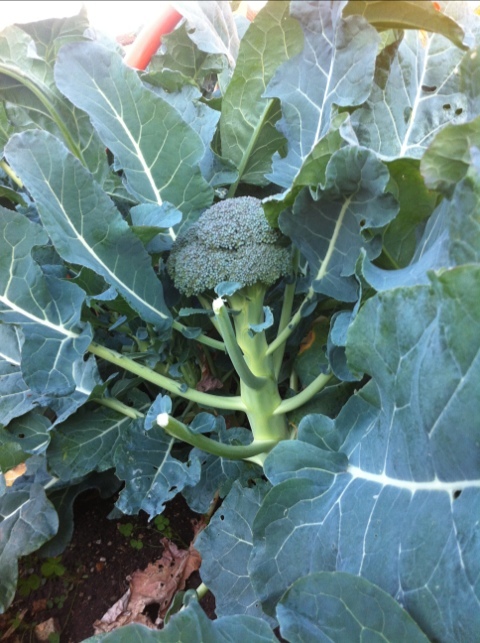 Below: A lovely broccoli on the stalk. 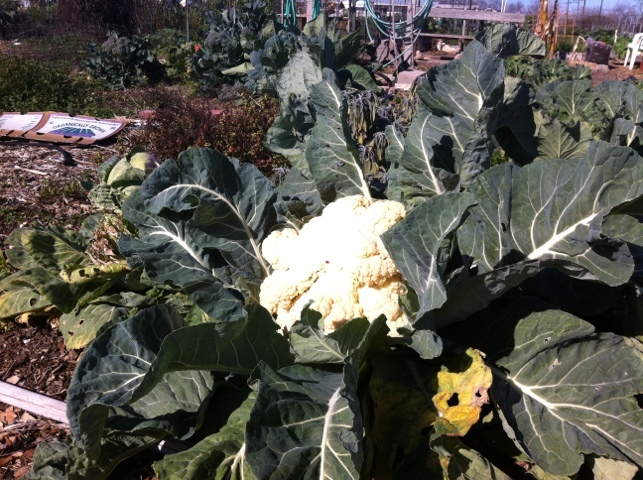 It’s amazing to me how little broccoli comes from such a huge, leafy plant! Maybe they cut off some of the crowns before I got there. Below: Not sure what this is. A variety of kale perhaps? Maybe small-ish chard leaves. Any guesses? The farmers were not present when I visited (a caretaker let me in). 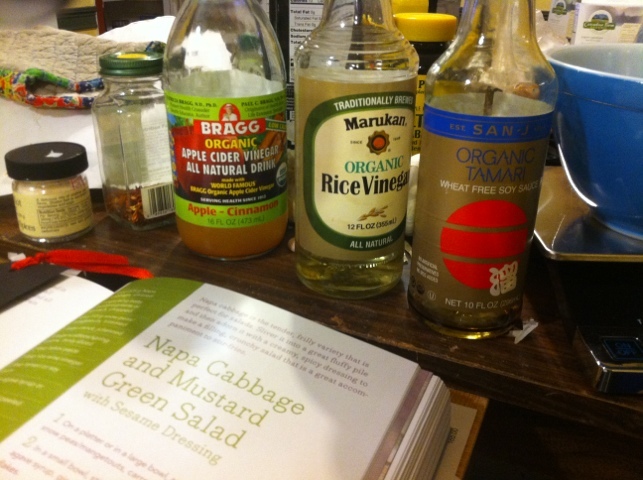 Sweetish Asian dressing + crunchy napa cabbage = happy tummy. 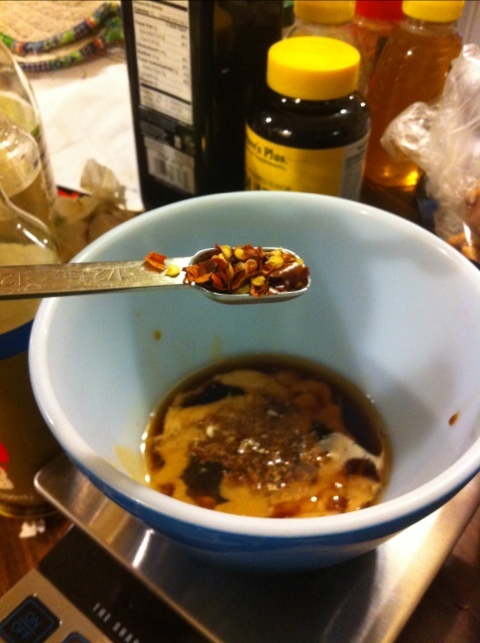 Below: First thing’s first: I HAD to smell those peppercorns. 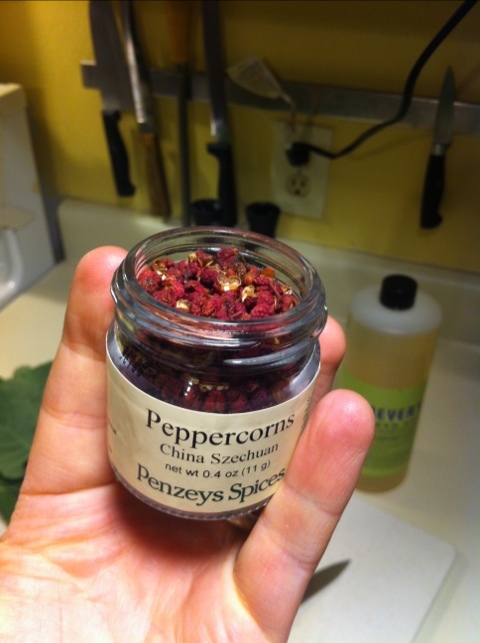 I had given up hope of finding some Szechuan peppercorns when I drifted past Penzey’s Spices on North Lamar. They had everything under the sun, so I brought home the peppercorns and gave them a whiff. They’re like nothing I’ve ever smelled before. Aromatic with mint and citrus notes. And spicy! But in a wholly unique way. And I don’t just mean really hot, I mean truly unique. My tongue is feeling hot and a bit raw as I type this from eating one of the peppercorns whole. I’d like to say that I loved it, but let’s say it’s a flavor that might have to grow on me. I really appreciate the novelty and the complexity, however. 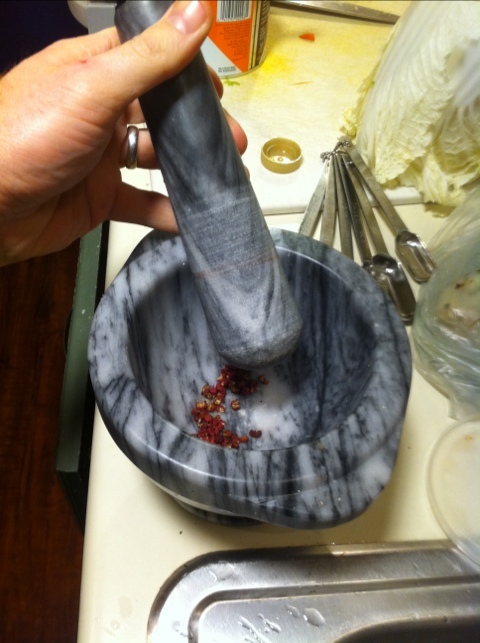 Below: Mortar and pestle, one of the most fun kitchen gadgets ever. 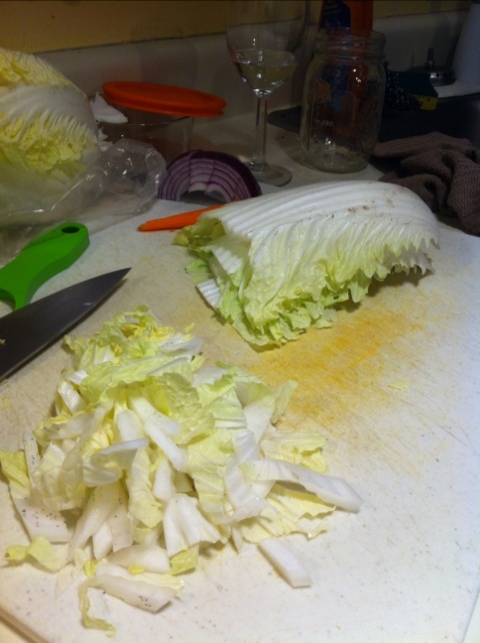 Below: Napa cabbage. 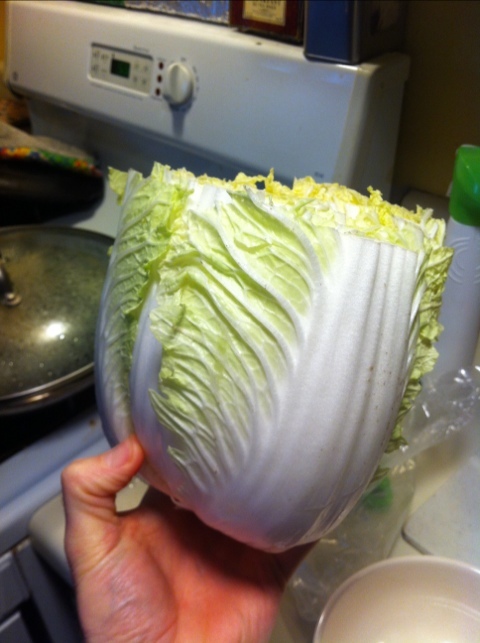 Before you run off and think that napa cabbage comes from wine country, let me tell you that it actually comes from China. 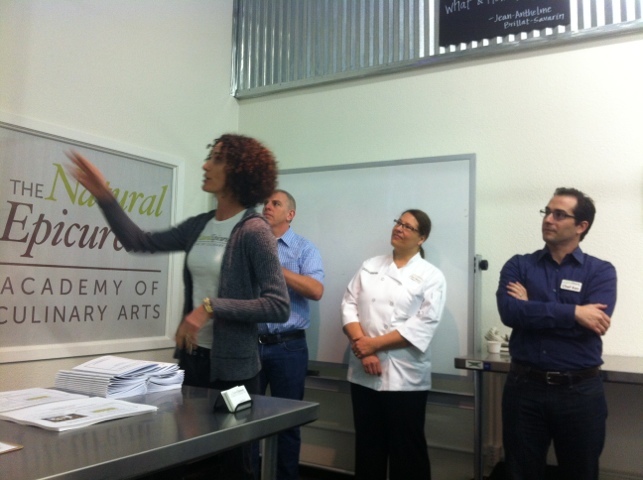 The term “napa” is from the Japanese term for edible vegetable leaves (1). A wonderful cruciferous vegetable, which are called Super Veggies by WebMD for their antioxidative powers and possible anti-cancer benefits. It’s the main ingredient in the main type of kimchi (a spicy fermented dish), so you could say that the Chinese cultivated it, the Japanese named it, and the Koreans use it — it’s a pan Asian foodstuff. 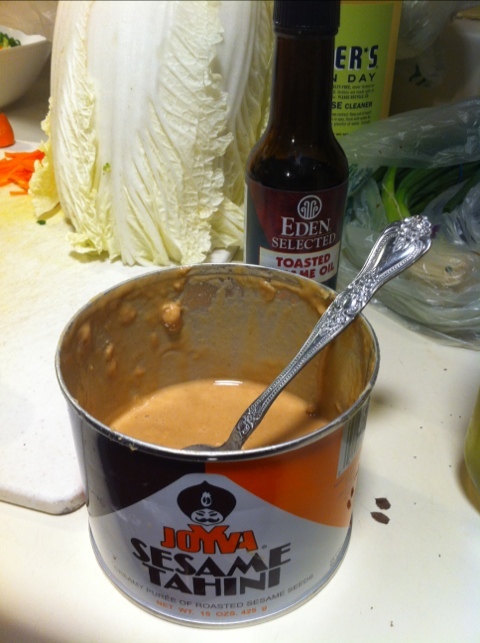 Below: Tahini, which is ground sesame seeds. It has a somewhat bitter taste straight out of the can, but it’s normally mixed with other things. It is used as an ingredient in hummus. Below: I want to dive into all of those amazing flavors right there! Below: Shredded leaves looking so sad and un-spicy. Below: The final product, complete with carrot shreds and snow peas. 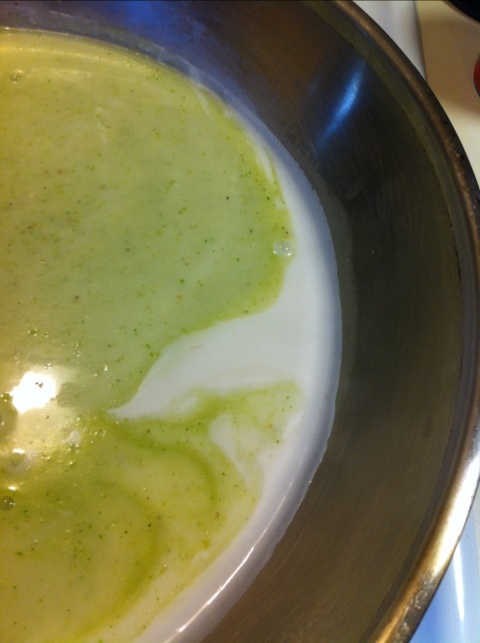 And, the delicious dressing. It was a sweet, soy-ish, ginger-ish, creamy delight that motivated me to make this salad three times in two days from scratch each time. So easy!